If you are looking to purchase an air rifle manufactured by Benjamin, the first thing that you are likely to notice is just how many different choices you have. Like many other air rifle manufacturers there are so many different air rifles to choose from. With all of those choices, picking out the best ones can often be overwhelming to the point that many people simply give up and just settle on something that they think looks good. Now whole looks are something to consider when purchasing an air rifle, there are several more important factors that you will need to take into account when making your purchase. The two most important factors are going to be what you plan to use the air rifle for and who is going to be using the air rifle. Knowing who is going to be using it also relates to the power of the air rifle, after all if a beginner is using it you won’t want something powerful enough to knock them off their feet. One thing to keep in mind when looking at we consider to be the best Benjamin air rifles is that each one has different features. Look at the features carefully and do your research before you decide what’s best for you. One of the most sought after features on this .25 caliber air rifle is that it comes with an 8-shot repeater, if you opt for the .177 caliber it comes with a 10-shot repeater in addition to an auto-indexing feature. As if having the choice between different calibers wasn’t enough, how about the ability to modify the air rifle for different velocities. 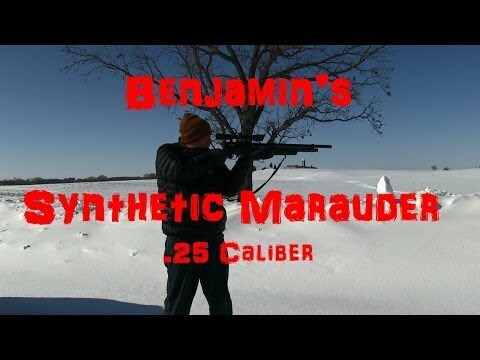 Not to mention the Marauder PCP comes with an internal shroud that helps make the gun quieter than other models. The foster fitting is perfect for rapid reloading and is something that you rarely see in air rifles. To aid in accuracy the Marauder features a 2-stage adjustable trigger, 11 mm dovetail, and a choked barrel. One of the most talked about features on Benjamin air rifles is the thumbhole stock, which comes on almost every Benjamin air rifle. We are happy to report that the Benjamin Titan GP Nitro Piston doesn’t disappoint, like majority of Benjamin products it features the amazing thumbhole stock. The reason why the thumbhole stock is so sought after because it makes it more comfortable to shoot, which is vital for people who spend hours outside shooting. The Titan GP Nitro Piston can be used by either left or right handers with ease and features a Muzzlebreak that gives shooters a little more leverage. 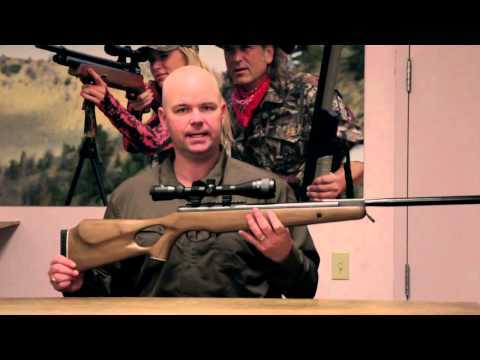 The .22 caliber air rifle offers shooters a break barrel design that uses Nitro Piston technology. The Nitro Piston technology allows for better shooting and cocking, plus it eliminates the risk of spring fatigue and torque, which enhances performance during colder weather even if the air rifle is left cocked for several hours. To help aid in accuracy the air rifle includes a 4×32 CenterPoint scope, but you will have to mount it yourself, but the air rifle is lacking open sights. Not only is this air rifle one of the more powerful models that Benjamin manufacturers, it is also easy to use and comfortable to handle. Misfires are a part of shooting, but they are not something you really want to deal with. To help reduce the chance of misfires the Benjamin Nitro Piston comes with a two stage, regulating trigger. This air rifle uses Nitro Piston technology to reduce both the noise and the recoil experienced by the shooter. And, to ensure you make the perfect shot, the air rifle comes with a 3-9×40 mm scope. This is another one of Benjamin’s most popular air rifles on the market. Like many other Benjamin air rifles, the Trail NP XL features the famous thumbhole stock, making it one of the more comfortable air rifles to shoot. To add even more to the comfort of this air rifle are the twin cheek pieces and the textured grip. All of these features work together to provide you with comfort so you hit your target each time you aim. The Center Point Optics scope also helps keep your aim true. If that wasn’t enough to convince you about the greatness of the Trail NP XL then perhaps the synthetic stock will. The beauty of the synthetic stock is it is extremely durable, plus it will withstand all sorts of weather conditions. And, the stock will not affect the power of this amazing air rifle. Backed by Nitro Piston Technology the Trail NP XL can reach speeds of up to 950 feet per second if you are using alloy pellets. If you prefer lead pellets you can expect speeds up to 800 feet per second. When it comes to purchasing an air rifle you are going to want to do your research before you buy one. Look closely at each of the air rifles that you are considering to ensure it has the features that you need or are looking for. Just because they are top rated doesn’t mean they are going to be the best choice for you.